Happy Monday! Hope you enjoyed a fabulous Thanksgiving weekend. I'll post pics of his bachelor pad soon. I'm thankful that my brother hosted Thanksgiving dinner, as my dining room was still missing enough chairs. 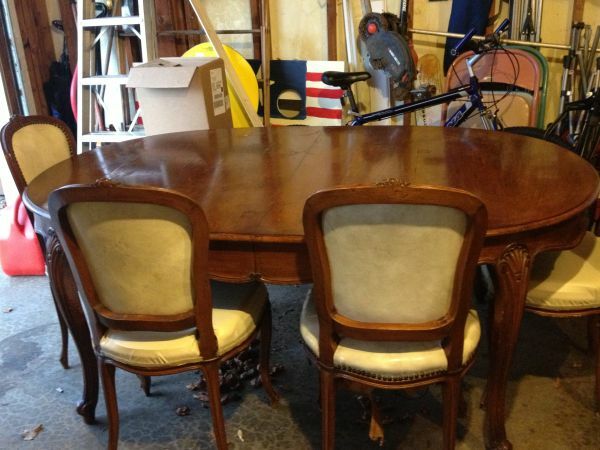 I bought a larger dining table and host and hostess chairs, sold my old dining table and chairs, and have been on the hunt for side chairs ever since. 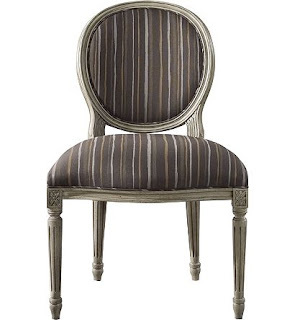 I had pretty much decided that the oval-back Louis XVI chairs would be ideal. if you are willing to spend $1,000 per chair on sale. Thankfully, I am not. I'm thankful that I didn't settle for the less expensive options at Restoration Hardware, Ballard Designs and Wisteria since they weren't exactly the finish and fabric I wanted. I need stain-resistant fabric. Remember... we're a red wine-drinking, kid-friendly household. So, that left me with craigslist and Ebay. I found several antique chairs, but once again, they were really expensive. And they had to be shipped. And they needed to be reupholstered. I'm thankful that I expanded my local craigslist search statewide and, eventually, to the surrounding states. So, they're not exactly oval. And they're more Louis XV than XVI. But I like them. They are real wood with intricate carving (circa 1930). They are sturdy. They have potential. And they're only 25 bucks each. I am thankful that I have a husband who doesn't question my potential insanity for purchasing chairs sight unseen in another state. I am especially thankful that said husband, on the day before Thanksgiving, drove 3 hours to downtown Chicago, dropped the kids and me at my brother's apartment, then braved the insane Chicago holiday traffic for an additional hour and a half to pick up dining chairs that his crazy wife bought sight unseen, and drove back another hour and a half without complaining. That's love, people. 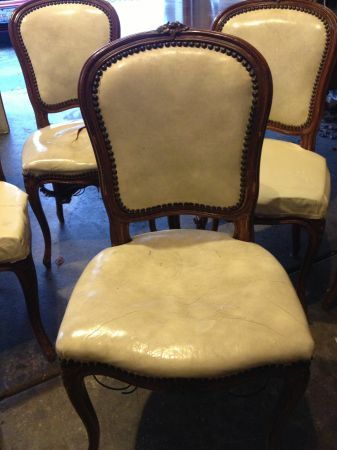 I've got big plans for these chairs... fresh paint, new upholstery, new nailhead trim. They're going to be great! I'm hopeful that they'll be ready by Christmas! Scored any great craigslist items lately? What's the farthest distance you've traveled for a good deal? You do have a good husband! The chairs are definitely worth it though! I can't wait to see how you fix them up! That Paul.....he's a keeper! Luv the chairs. I'd pick them in a heartbeat. It was a great choice. Can't wait to see them. Are you going to give us a hint about your fabric choice??????? These are perfect ...I'm looking for dinning room chairs also. I guess I need to expand my search! Yeah for wonderful husbands who understand us!!! So glad you had a wonderful Thanksgiving and WHAT A VIEW!!! Lucky girl - great husband & great chairs! Can't wait to see how they turn out. What a good husband!!!! One in a million that is for sure. Your new chairs are beautiful! Can't wait to see their makeover. That is one high and spectacular view..and I am beyond excited to see how you save those chairs!